Nicolai Fechin’s palette knife makes the shadows that make the heat of the day in Taos Pueblo House. As a woman holds her child’s hand in the shade of the scaffolding at left, a man sitting on the second story scaffolding at right grinds meal in a metate and the domed clay oven, or horno, is tended below. Fechin creates the adobe walls and road with layers of earth tones and highlights of white that give the work a warmth and feel for the layers of history. The blue green mountains behind the pueblo enfold the scene. This is a place apart, distinct, special. Nicolai Fechin was born in Russia’s rugged Tartar forest in 1881 where his father was a noted woodcarver and maker of icons. At 13, Fechin began his training at the Art School of Kazan, studied in St. Petersburg, and ultimately earned a six-year scholarship to the Carnegie Institute in Pittsburgh. Fechin began to work with a palette knife and experiment with color application in a broadly impressionistic way. His paintings soon came to the attention of prominent American institutions and collectors; these connections helped him elude the hardest of the many hardships of the Bolshevik Revolution after he returned to the new Soviet Union. In 1923, Fechin and his wife left the U.S.S.R. and moved to New York. When Fechin developed tuberculosis, a doctor suggested he move to the Southwest for his health. 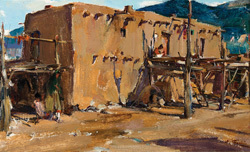 One of Fechin’s friends, the artist John Young-Hunter, mentioned Taos. Fechin took his advice and found the countryside not only healthful but reminiscent of the woods and mountains of his youth. A few dots of inpainting in upper sky area near frame.